Conan O'Brien is hosting the MTV Movie Awards this weekend, following in the footsteps of Rebel Wilson, Russell Brand, Jason Sudeikis and other funny, wildly likable humans. While this makes perfect sense since Conan has done a brilliant job hosting the Emmys, it does make me wonder how his regular hosting gig doing these days? Is anyone still watching Conan ? When Conan first premiered on TBS, the Tonight Show controversy was still following the comedian and helped him pull in over four million viewers his first night on cable. The ratings steadily dropped as the show went on for the next few days and he ended his first week down two million viewers. Since then, Conan's show has averaged less than a million viewers each night. But in 2011, TBS head of programming Michael Wright stated he would never cancel Conan with these kinds of numbers. 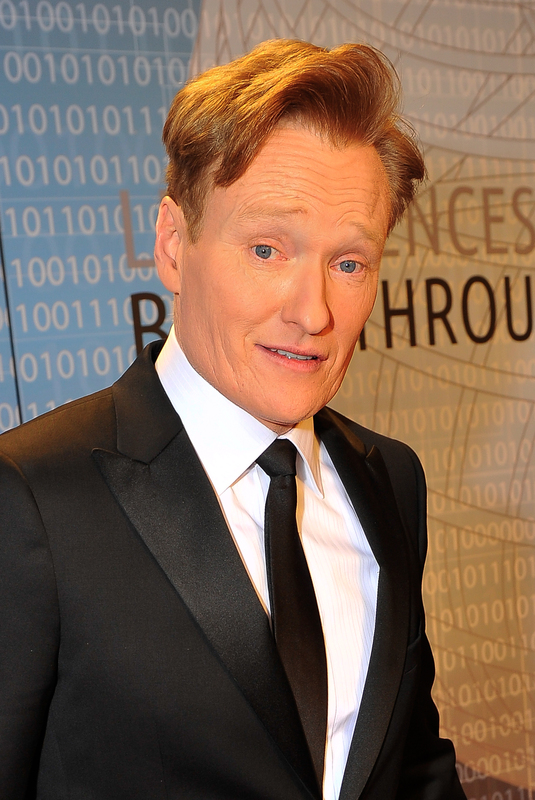 In fact, the network has extended Conan until November 2015. Now, it seems like this doesn't make any sense, especially since Conan has, on multiple occasions, fallen below in viewership compared to his other cable counterparts like The Daily Show and The Colbert Report. But the upside is that Conan has a more diverse and younger viewership, which is extremely valuable. Basically, O'Brien just does a really great job attracting young viewers. And considering how hard it is for most of us to put our attention on anything longer than a two-minute Youtube video, this is really saying something in the late night talk show universe. That's also why MTV made the best choice picking O'Brien as its 2014 Movie Awards host. The comedian is very adept at putting together pre-taped sketches that are just short and clever enough to be perfect for the most patience-challenged of all of us. He also does a consistently great job getting stars on his show that are attractive to the younger crowds. Even when his show gets a bit repetitive, O'Brien (and his sidekick Andy Richter) somehow always find a way to produce great content. It's nice to have him on our screens and it's nice that the leaders of basic cable TV agree.